348 pages | 250 B/W Illus. The effects of climate change, rapid urbanization, and aging infrastructure challenge water policymakers to confront a radical paradigm shift in water resources utilization. Recent advances in sensing, networking, processing, and control have provided the means for sustainable solutions in water management, and their implementation in water infrastructures is collectively referred to as "smart water grids." Smart water grids depend upon cyber-physical system principles to effectively respond to issues regarding the scalability and reliability of dynamic and inaccessible environments. As such, unique smart water grid issues associated with front-end signal processing, communication, control, and data analysis must be jointly addressed, while sophisticated techniques for data analytics must be introduced into cyber-physical systems research. This book provides a thorough description of the best practices for designing and implementing cyber-physical systems that are tailored to different aspects of smart water grids. It is organized into three distinct, yet complementary areas, namely: the theory behind water-oriented cyber-physical systems with an emphasis on front-end sensing and processing, communication technologies, and learning techniques over water data; the applications and emerging topics of cyber-physical systems for water urban infrastructures, including real-life deployments, modern control tools, and economic aspects for smart water grids; and the applications and emerging topics across natural environments, emphasizing the evolution of fresh water resources. The structured discussion yields a rich, comprehensive body of knowledge on this emerging topic of research and engineering. 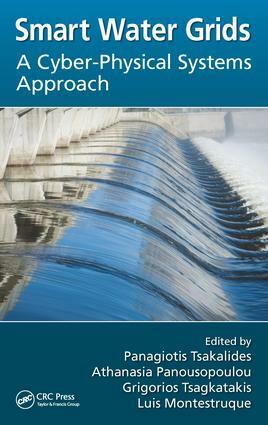 As water issues intensify on a global scale, this book offers an algorithmic and practical toolkit for intermediate and advanced readers as well as professionals and researchers who are active in, or interested in, learning more about smart water grids. Emphasizes the multidisciplinary nature of this emerging topic, covering both theoretical and practical aspects of this area while providing insights on existing deployments, which can serve as design examples for new applications. Explores how modern signal processing and machine learning techniques can contribute and enrich the potential of smart water grids, well beyond conventional closed-loop control techniques. Highlights complementary aspects that will help shape the future of smart water grids, such as consumption awareness, economic aspects, and control tools in industrial water treatment as well as the impact of climate change on fresh water resources. Enables the reader to better understand this emerging topic, investing in current state-of-the-art and future technological roadmaps for smart water grids. Theory and Design. Introduction. Hardware (Sensors and Actuators). Communication Technologies for Smart Water Grid. Processing and Learning Water Data Analytics. Distributed Control for Efficient Water Management. Security and Safety (Contamination Aspects). Network Topologies, Standards, and Interoperability Aspects. A Systematic Design of CPS Architecture for Enabling Water Smart Grids. Practical Applications. Water Treatment and Desalination. Water Distribution Networks. Irrigation and Industrial Use. Waste and Sewage. Water Reusability & Drought Management. Special Topics. Water Standardization Policies. User Empowerment and User Awareness. The Water-Energy Nexus. The Water-Food Nexus. Appendixes. Glossary. Index. Prof. Panagiotis Tsakalides received his Ph.D. degree in electrical engineering from the University of Southern California, Los Angeles. He is a Professor and the Chairman of the Computer Science Department at the University of Crete, and the Head of the Signal Processing Laboratory at the Institute of Computer Science (FORTH-ICS). He has coauthored over 150 technical publications in these areas, including 30 journal papers. He also has extended experience with transferring research and interacting with the industry. Dr. Athanasia Panousopoulou received her PhD in Electrical and Computing Engineering from the University of Patras, Greece. Athanasia has 10-years of expertise with the design and deployment of wireless sensor networks and CPS in hostile and RF-harsh environments. She is a chartered engineer from the Technical Chamber of Greece since 2004, a member of IEEE, and she is serving as a reviewer in numerous research forums, edited by IEEE and Springer. Dr. Grigorios Tsagkatakis received his Ph.D. in Imaging Science from the Rochester Institute of Technology, New York. He was a Marie Curie post-doctoral fellow at the Institute of Computer Science (ICS), FORTH and is currently working as a research associate with the Signal Processing Laboratory at FORTH-ICS. He has co-authored more than 30 peer-reviewed conferences, journals and book chapters in the areas of signal and image processing, wireless sensor networks and machine learning. Dr. Luis Montestruque, EmNet LLC, is the President and Chief Technology Officer for EmNet, LLC. He earned his Ph.D. in Electrical Engineering at the University of Notre Dame in 2004. With over 15 years of experience in industrial CPS, his experience spans from theoretical research of large dynamical systems to implementation of water-related real time control systems. He has led the design and implementation of CPS in more than a dozen cities across the United States.